Source: TelexFree website, Aug. 16, 2013. TelexFree, an MLM “opportunity” under investigation in Brazil amid allegations it is orchestrating a massive pyramid scheme, says on its website that it is conducting an “at sea” event Dec. 15-18. 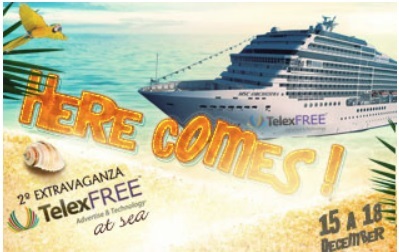 Perhaps accidentally providing an awkward hint of dire portent, the promo shows the TelexFree logo superimposed on the side of a luxury ocean liner that is nearly beached in the tropics. Even more incongruously, it is being published not only against the backdrop of the pyramid probe, but also against reports that a judge and prosecutor in Brazil have received death threats related to the investigation. Promoters of MLM HYIP scams such as JSSTripler/JustBeenPaid (2 percent a day) and AdViewGlobal (1 percent a day) previously have advertised sea cruises. It is unclear if the JSS/JBP cruise ever came off. AVG’s 2009 cruise coincided with a bid (apparently unsuccessful) by the “program” to line up another bank and wire facilitator to assist in the swindling of investors who’d previously been swindled in AdSurfDaily’s $119 million Ponzi scheme that advertised a 1-percent-a-day payout. AdViewGlobal, which purported to operate from Uruguay, bizarrely announced its new scam on the same day the President of the United States announced a crackdown on offshore fraud. Federal prosecutors later said they’d tied AVG to ASD President Andy Bowdoin. Some TelexFree promoters say a payment of $15,125 to the program results in a profit of at least $1,100 a week for a year. Other promoters claim they’re “100% telexfree,” which apparently means they’ll stand by their “program” no matter what. Researching the phrase “at sea” shows that it’s a nautical term that denotes the dangerous phase of a ship that is NOT within sight of land (before accurate navigation became available). K. Chang: What expression uses “at sea”? Assuming TelexFree actually has booked a cruise on the MSC Orchestra and that TelexFree makes it through the booking dates, well, the ship will be carrying a good number of Ponzi enthusiasts during a period known as “Black December” in HYIP Land. After WWII in Odessa , soviet government was not wining a war on after war crime. The Solition was to put all crime bosses on the ship and ship sailed, nobody ever saw them again. Picture of many ponzi pimps on the same boat reminded me of that. Maybe it’s just me, but I don’t think putting all of the offendants / defendants of an ongoing investigation in the one spot at the one time will go down in history as one of the smartest strategies to come out of the ponzi world.